Whether you’re a trademark lawyer or an in-house counsel we are here to support you in your daily work and help you to focus on what you do best. We understand the challenges you are facing whether it’s the time pressure you are working under, budget restrictions or the limited resources you have access to. Consider us one of your team! We develop our products with our customer’s needs in mind. 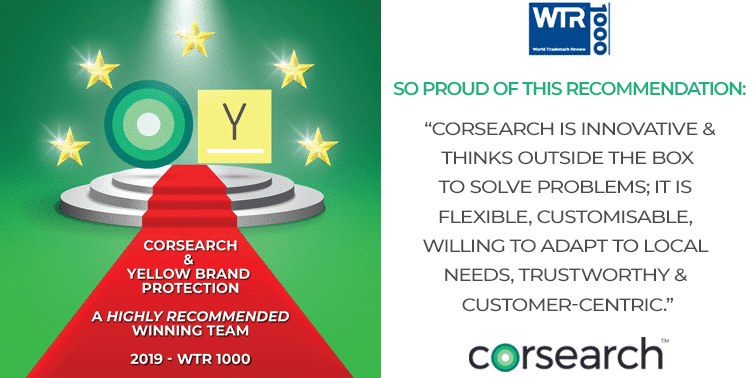 That’s why 43 out of the world's 50 top brands rely on Corsearch. We're a partner, not just a vendor. We understand the challenges faced by our customers in the modern business environment. Global awareness, client pressures, and market opportunities demand the need for a responsive and invested business partner, not just a vendor. Our Corsearch account managers, researcher teams and leadership commit to be responsive, flexible, and to listen. When our customers need us, we are always available. When you have a support question, we’re here to listen and help. And when the work is done, it is completed under the irreplaceable eye of an experienced analyst. Corsearch thrives and constantly improves because of our relationships with our customers. Corsearch is innovative and thinks outside the box to solve problems; it is flexible, customizable, willing to adapt to local needs, trustworthy and customer-centric.